Sort of appropriate that during a week when it was revealed that a whole bunch of crooked New York City policemen scammed taxpayers out of millions of dollars of undeserved disability and retirement income, today’s Pinstripe Birthday Celebrant happens to also be one of the most well-known corrupt cops in the history of NYPD. 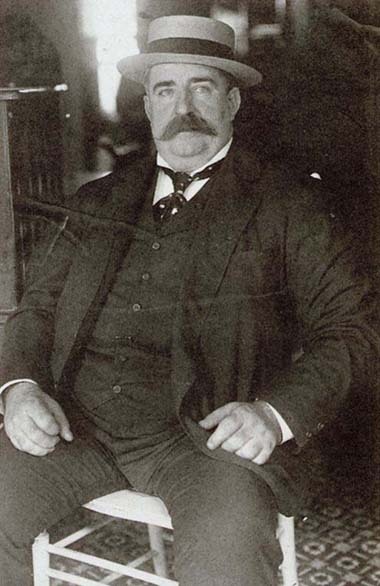 “Big Bill” Devery became one of the first owners of the Yankee franchise when he silent partnered with the notorious saloon owner and gambler Frank Farrell, to purchase the struggling Baltimore Orioles’ American League franchise in 1903 and move it to New York. Devery was really nothing more than a super-sized Tammany Hall-backed bribe collector with a badge, who demanded tribute from just about every border-line illicit business in his Manhattan precinct. This slob used to stand on a prescribed street corner and accept bribes in full view of the public. So crooked was the Big Apple police force back then that a brazen thief like Devery actually rose to the rank of Chief of Police in 1898 before the decade-long reform movement initiated by Teddy Roosevelt and a team of muckraking New York City newspaper and magazine reporters, finally took hold. Unfortunately for the cause of justice, Tammany Hall still maintained enough control over the City’s court system to get Devery acquitted of corruption charges and he was able to retire a free man, collect his pension and take full advantage of all the loot he plundered from his policing days. There was enough of that loot for him to put up half of the $18,000 purchase price he and Farrell paid for the Orioles in 1903 plus finance the hurried construction of a playing venue for the new team in the Washington Heights section of Manhattan that would come to be known as Hilltop Park. The new club’s co-owners had such questionable character that their identity was kept secret for months as negotiations over the sale of the team and construction of the park were completed. Baseball historians are still a bit perplexed over the fact that AL President Ban Johnson, a man who was so concerned with the crystal-clean image of his league, would choose to comport with men like Devery and Farrell. The best answer put forth thus far was that Johnson needed their City Hall and labor group connections to get the new ballpark built in time for the 1903 baseball season. Whatever the reason, Devery proved to be especially inept as an owner of a baseball team and for the most part, permitted Farrell complete control over all management decisions. His most famous interaction with the Highlanders’ operation occurred during the 1914 season. Farrell had hired the legendary Cubs manager, Frank Chance to skipper the team that season. By that time, Devery had learned enough about baseball to make it a point to publicly criticize Chance for poor decision making after several Highlander losses. The crooked cop-turned owner made the mistake however, of issuing one of his criticisms of the New York manager right after a tough loss while standing in close proximity to the frustrated skipper in the team’s locker room. Chance, who had a well-known reputation as a brawler took a swing at Devery but missed, as onlookers quickly moved in to separate the two. Can you imagine if Chance was manager at the time Steinbrenner owned the Yankees or if Billy Martin was skipper when Devery owned half the team? There would have been a murder committed in the Yankee locker room. As it turned out, Chance wasn’t the only guy growing tired of Big Bill. Frank Farrell had grown to hate his crude and hefty partner as well. The two men stopped speaking to each other and Farrell actively started looking for someone willing to buy Devery’s share of the club. Sure enough two prospective buyers turned up but they weren’t interested in purchasing half a team, they wanted it all. On January 30, 1915, brewery owner Jacob Ruppert and construction magnate Tillinghast Huston paid Farrell and Devery $460,000 for the Highlanders. Devery died in June of 1919 at the age of 65. Though everyone assumed he had plenty of money, the probate court declared his estate to be in debt at the time of his death. He shares his January 9th birthday with this former Yankee 20-game winner, this one-time Yankee outfield prospect and this one too. An on-the-field failure by today’s birthday celebrant, actually left me in tears. Yeah, I know Tom Hanks insisted “there’s no crying in baseball” in the movie “A League of Their Own,” but he wasn’t a six year old at the time, watching his beloved Yankees lose the final game of the 1960 World Series. In fact, the pitch that Ralph Terry threw to to Bill Mazeroski on that October afternoon in Pittsburgh almost fifty years ago, is the first memory I have of being a Yankee fan. When that ball sailed over the ivy-covered left field wall of old Forbes Field, my tears started flowing. I was more livid with Mazeroski than anybody else. How dare this perennial singles hitter get lucky against the world’s greatest baseball dynasty. And my grudge lasted against the Pirate’s longtime second baseman. When the Veteran’s Committee put him into Baseball’s Hall of Fame years later, I distinctly remember cursing the committee. I was pretty upset with Terry too, but it did not take long for my hostile feelings against the tall right-hander to dissipate. 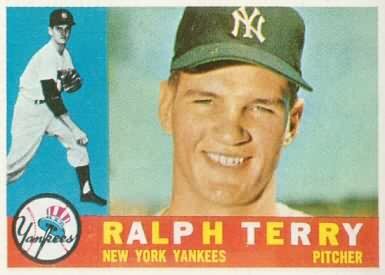 But it was 1962 that forever changed the way I felt about Ralph Terry. First off, he won 23 regular season ball games that year. When you’re a Yankee fan, however, you don’t measure players by their regular season performance. Instead it becomes all about the post season. That year, the Yankees faced a very talented San Francisco Giants team, led by Willie Mays, Orlando Cepeda, Willie McCovey, and Juan Marichal. The series was tied three games apiece. Terry had pitched well in the second game but lost 2-0, his fourth consecutive Series defeat over the past three seasons. He finally broke that skid when he came back to get the win in Game 5 but I’m sure I was feeling pretty nervous when New York Manager, Ralph Houk gave his big righthander the ball to start the seventh and deciding game. Terry pitched brilliantly that day and had held the home team Giants scoreless thru eight innings. In the bottom half of the ninth, with the Yankees leading by just one run, Matty Alou led off with a bunt single. Terry then settled down and struck out Matty’s brother, Felipe and Chuck Hiller. Willie Mays then doubled sending Alou to third with the tying run. The next hitter, Willie McCovey blasted a line drive toward right field. If “Stretch” had hit that ball just a few inches further left or right, Ralph Terry might have officially replaced Bill Mazeroski as my most despised baseball player in history. Fortunately, however, McCovey’s screaming liner was hit directly at Yankee second baseman Bobby Richardson, who after the game admitted he just threw his glove up and luckily snared it. Richardson still claims it was the hardest hit ball he’d ever fielded. Terry was born in Big Cabin, OK, in 1936. He became a golf pro after his baseball playing days were over and actually competed on the PGA Senior Tour. He shares his January 9th birthday with this former co-owner of the Yankee franchise, this one-time Yankee outfield prospect and this one too. If you were a young prospect in the Yankee organization back in the eighties, you usually were not one for very long. That’s because George Steinbrenner treated the franchise’s top minor league talent as currency for the sole purpose of being used to acquire older, more experienced big league veterans. Today’s birthday celebrant was a good example of that philosophy. 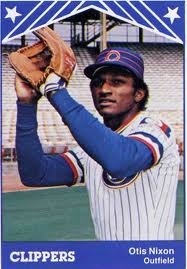 Back in 1983, Otis Nixon was considered the top outfield prospect in the Yankee organization. He had been New York’s top selection and third overall pick in the 1979 amateur draft and moved steadily up the alphabet ladder of the team’s minor league affiliates. Though he had little power, Nixon had blazing speed and a great batting eye and he raised the eyebrows of the entire Yankee organization when he stole 107 bases during the 1982 minor league season. His lowest on-base-percentage during his five year climb through the team’s farm system had been .391. New York brought Nixon up for a cup of coffee look in September of 1983. He got into 13 games, got his first two big league hits, scored his first two runs and stole his first two bases.The following February, the Yankees had to include Nixon in the deal they made with Cleveland for veteran third baseman Toby Harrah. Harrah ended up playing one season and 88 games in pinstripes. Nixon ended up playing sixteen more seasons of big league ball which included tenures with nine different teams. He collected 1,379 hits, stole 620 bases, batted .270 and had a lifetime on base percentage of .343. Nixon was born on January 9, 1959 in Evergreen, NC. He shares his birthday with another former Yankee outfield prospect who had a long big league career away from New York, with this long-ago co-owner of the Yankee franchise and also with this former Yankee 20-game winner. The son of long-time Cardinal second baseman Julian Javier, Stan Javier was named after his dad’s storied St. Louis teammate, Stan Musial. Originally signed by the Cardinals in 1981, when he was just 17-years-old, he and Bobby Meacham were traded to New York the following year. The younger Javier was an outfielder who played well enough at each level of the organization’s farm system to advance quickly up the ladder. Invited to the Yankees 1984 spring training camp, Manager Yogi Berra announced Javier would be on the team’s Opening Day roster, but would remain in the Bronx only until Oscar Gamble recovered from an injury. He appeared in seven games for New York during that first month of the 1984 season, mostly as a late-inning outfield replacement. He only managed seven plate appearances but he got his first big league hit off of Cleveland’s George Frazier and scored his first big league run. 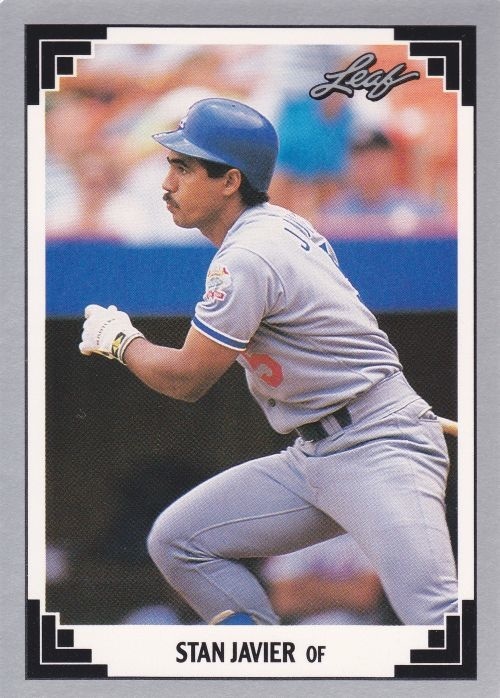 He was sent back down to the minors at the end of April and then the following December, he was included in the five-player package the Yankees used to get Ricky Henderson from Oakland. Javier went on to put together a very decent 17-year big league career. He played for seven big league teams collected 1,358 hits and finished with a .269 lifetime batting average and a .345 on base percentage. Javier shares his January 9th birthday with this other former Yankee prospect who enjoyed a long and successful big league career as a non-Yankee, with this long-ago co-owner of the Yankee franchise and with this former 20-game-winning Yankee pitcher.